Amalfi Coast (Italy) - Hiking, Beach and Sightseeing. The Amalfi Coast is one of Italy's most piercing destinations. Here, mountains plunge into the sea in a nail-biting vertical scene of precipitous crags, cliff-clinging abodes and verdant woodland. The landscape is immensely varied and surrounded by infinite ever changing views. It can be typical Mediterranean, intoxicated by wild perfumed herbs, with myrtle shrubs, thyme, rosemary and mastic trees, or almost alpine with meadows and bare rocks. 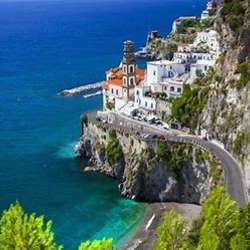 We will walk the coastline of Amalfi, visit the popular Positano town and relax on one or two of the beautiful beaches. The highlights of the long weekend will include hiking, sightseeing, relaxation on the beach, shopping, dining, boat trips and some nightlife. Day 1 Friday Sep 20. Transfer from airport to accommodation our guest house. Day 2 Saturday Sep 21. The name of the footpath, The Path of the Gods, is an indication of the spectacular scenery en route. This is one of the most spectacular on the whole of the Amalfi Coast. We finish in Positano – considered to be the most picturesque and photogenic town on the coastline. We will walk around the town and make a visit to the beach. There will be time to sightsee and shop in some very colourful boutiques. We then take the boat from Positano to Amalfi and return to our guest house. Transport back to accommodation from Amalfi is by bus. Day 3 Sunday Sep 22. An expedition through the jungle of ferns which carpets the slopes behind Amalfi, discovering the ruins of the towns medieval foundries. This is a challenging walk with some rough and uneven tracks and narrow paths in places. You need to be fit to do this walk and also not a good one for vertigo sufferers. There is an option of doing your own thing if you don't fancy the walk. After the hike, we will explore the Amalfi’s historic streets. Transport back to accommodation from Amalfi by bus. Day 4 Monday Sep 23. Free day – A day to do whatever you fancy. •	Visit the gorgeous island of Capri and explore the remains of the Imperial villa of the Roman Emperor Tiberius. •	A visit to Ischia Island. •	Visit Ravello - a small town with beautiful coastal views. Day 5 Tuesday Sep 24. A private tour of Pompeii and (Herculaneum or Mount Vesuvius). We will do all three if term permits. A journey back in time to the ancient Roman cities of Pompeii and Herculaneum, buried beneath meters of burning ash during the eruption of Mount Vesuvius in 79A.D. Visit the smouldering crater where the peak of this imposing mountain once loomed over the coastline. We will have a private licensed taxi return transfer with a professional English speaking driver who will be with us for the day. Day 6 Wednesday Sep 25. For those who have the strength, we will go on a short hike in the cave near the guest house. Transport back to the airport is after lunch. Early discounted price of £525 if you pay your deposit of £150 by April 15, Protected content . After this date the price is £575. Pay early to avoid paying the full price. Single supplement is an additional £100. The balance is expected by July 1st Protected content . -Packed lunches on the two days we are hiking. -5 nights accommodation on a sharing basis - Twin or Double (I cannot promise a twin so you might have to share a double bed). -Airport transfer to the guest house for everyone taking the recommended flight options. -Return transfer to airport – also for those who take the recommended return flight. -All travel on local public buses on hiking days. -Return transport to Pompeii, Herculaneum and Mount Vesuvius. Lunches on the non-hiking days. All and any mode of transport on the free day. Travel insurance – You will need to provide a copy when you have fully paid and confirmed. Locally imposed tourist tax of about 1. Protected content per night, payable to the guest house. Transfers from and back to Naples airport will be arranged to suit the recommended times. Please book ASAP before price goes up. NOTE: Hiking and especially this one carries a risk of injury. It is an outdoor activity and some paths are narrow with uneven surfaces. When you RSVP, you confirm you are in good health and accepts the risk. Please bring along with you your personal first aid. Phone/text/message if you have any questions.